Picking up on our story: On his arrival in the Arctic in 1878, Frederick Schwatka was unable to find any Netsilik who answered to Thomas F. Barry's description of the men who had brought him the Franklin spoon. The only Inuit who knew of this spoon declared that it had been given not to Barry, but to Captain Potter. Schwatka promptly dispatched his second-in-command, William Gilder, on a sledge journey to Repulse Bay to ask Potter himself, who declared that the spoon in question was missing, and that he suspected Barry had stolen it, later fabricating the story about Inuit witnesses. Many -- myself included -- have wondered why, since Barry was present at Repulse Bay when Gilder came to ask Potter about the spoon, they didn't confront him then. 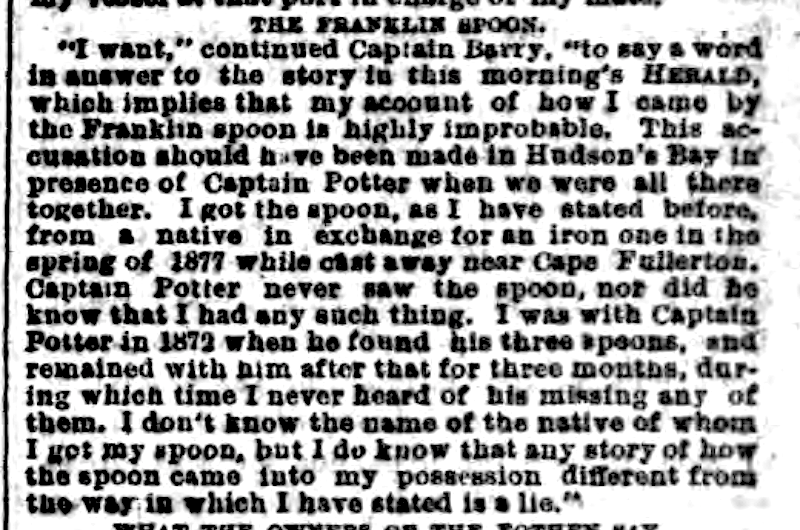 Apparently Barry wondered as well; when questioned by his employers on his return he gave the account above, denying categorically that he had stolen his spoon from Captain Potter. This wasn't what got him into the most trouble, though. As part of his contract, he'd agreed to leave supplies and provisions at Depot Island near Camp Daly for Schwatka's return, but did not do so, an act of neglect which greatly irked Schwatka and his party, who were obliged to beg for supplies from another whaler in the vicinity. Barry tried to explain that, after giving additional supplies to Schwatka before his departure, and feeding two Inuit members of the party left in his care, there was very little bread left, and a much reduced amount of other provisions. He endeavored to reach his goal and leave these behind, but was unable due to adverse ice conditions; nevertheless he swore that he had not misappropriated them, and that the log of the "Eothen" would prove him right. That logbook, unfortunately, was still on the ship, which had returned to Hudson's Bay under another commander. All this led to his condemnation and dismissal by his employers, and his storming out of the interview with the reporter from the Herald quoted above. His later fate is a mystery; although a man of the exact same name served as a tutor to several members of William Randolph Hearst's family in the 1880's, it's hard to imagine our choleric whaling captain was the same man. As to the logbook of the "Eothen," it's now at the New Bedford Whaling Museum; in an upcoming post, I'll tell whether this record vindicates Barry -- or not.